The new Redding branch opened on March 3rd, 2007 and has since been providing numerous opportunities for the citizens of Shasta County. 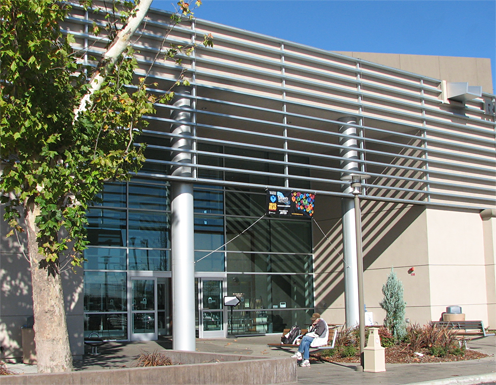 The new building, one of the first of its kind in Shasta County, showcases such things as a rooftop garden, numerous solar panels, and thermal energy storage, as well as The Giving Tree, and several other donated pieces of art. The new building offers three study rooms, two conference rooms, one large community meeting room, and a computer classroom, all of which can be reserved for public use. There is WI-FI available throughout the building free of charge. If you do not have a computer of your own, you can freely use one of our 40+ internet capable computers. We have microfilm readers, an ADA software enabled computer, a broadband videophone, a large computer classroom in which we give free computer classes, as well as two genealogy computers with volunteer assistance available at select times. Learn about the Friends of Shasta County Libraries who help support the Redding Library.